UPDATE 40 Days in Beta related to visits: Now the visits per day has returned to 170. UPDATE 3 DAYS LATER related to visits. The "Visits / day" metric for "33 days in Beta" has fallen to $222$. If this was an average ("total visits over total days") it would tell us that the last three-days average was only 62 visits/day. Thankfully, as @EnergyNumbers comments, this is not an average but a median metric. In that case, it simply tells us that the last three days were below 238/day, nothing more (they could be between 222 and 238, or below 222). So it is not very helpful for short-term tracking. Nevertheless it is an indication that our core "visits" trend is currently downward sloping. Let's hope this has something also to do with the onset of the holiday season. We are continuously dropping on this one, and have reached the alert point of 5. So no, it is not "okay" - we need more questions. That's more than "okay", IMO. I fear not this metric, every site has some dedicated people that see to it that many questions get at least one answer. It does need work, but my feeling during the last days is that it is getting better, even though the 90-day projection looks bad. Vote people, vote. Needs some monitoring, but I think it won't be difficult to maintain 2 Q/A. It was ~170 at ~the 15th day I think, rose to ~260, then it fell. I don't think it is bad for 30 days in beta, but we sure need to get it up. Remember that the metric may be biased upwards due to the 2.8k views question about minimum wage , and we may see it continuously dropping in the next days. Overall: We need more questions, this is more important than, say, Avid Users, or Visits. More questions mean more content, which will increase visits and users in the mid-term. We need more questions (and alas, I know I have contributed just one question). And more votes. Sure we need and we want the experts, but how do you propose that we will get them? How do we build a community of skillful people? In my experience, meeting places that succeed are meeting places that buzz -with all kinds of noise. A hundred bad questions, are a hundred questions that can be edited to become readable and interesting, and then be excellently answered. Ten excellent questions are just ten -too few. 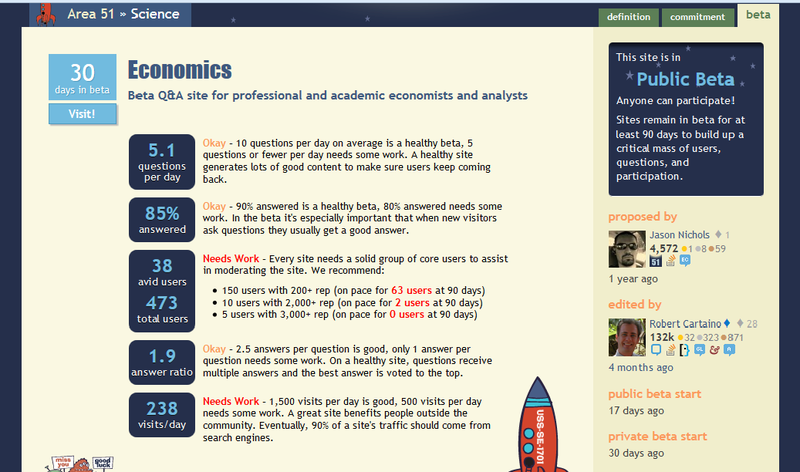 So I prefer to have something to work on and try to improve it so that it becomes attractive, rather than hope that somehow, in what way?, the experts we all want will embrace a nascent Q&A site with no a priori credentials in sufficient numbers, and start steadily asking questions and posting answers. If there are questions, of any quality, then we can really do something about it. If there are too few questions then we can mostly hope that these experts will appear, on their own or because they have responded to our direct invitations. Now, "just wait and hope" is not my kind of thing. "Sending invitations", I did, and will continue to do. "Working the questions" in any way, from commenting and editing to closing to deleting to answering is how I try to help things I am interested in succeed, i.e. by creating the credentials needed to attract the experts. And the credentials need the buzz: most people, experts included, don't like to stay around in silent places, empty places. But if they see and hear buzz, a lot of it annoying some of it attracting, there are more chances that they will side with the "attracting" trying to push off the annoying. This is a massive site, not an exclusive club where prospective high-standing members demand, and rightfully so, to be spared the lowlifes. In another thread we both agreed that we "trust the SE experience": and all I "hear" from this experience all over the SE world is volume, volume, volume . And it makes sense, because if you have volume, you have a chance to create quality in sufficient volume. Otherwise, your carefully crafted quality over precious few gems, will probably prove to be too weak a signal for people to notice (and for SE to spare the site). What we really need is new active experts, graduate and postgraduate economists and econometricians. Everything else will follow from that. Any fool could ask a hundred bad questions. The stats would get a temporary boost, and the site would be a worse place because of it. In a year's time, the new questions asked in the coming month will be be useful content for search engines, but have little life beyond that. And yet over that same period, the new experts who arrive in the coming month and decide to stay, will still be here in a year's time generating new awesome content. It's all about building a community of skillful, knowledgeable people. Do that, and everything else will come good. Fail to do it, and no other stats will save us. And it's perfectly reasonable to ask how we do this. I don't know. I try things, but there are plenty of other people who are far better at it than I am, so all I know is that I'm not in any place to offer advice. What people say is: share good questions on Twitter and other social media; use your other online networks to link back to great content here; pass on links to interesting content, to colleagues via university intranet discussion forums and the like. Now, I've tried that with precious little success. But other people seem to get it to work. I don't yet know what makes the difference between success and failure. But I have found a few things that don't work for me, the way I do them, so I guess that's a start. Telling postgrad PhD students that it's a Stack Overflow for their own subject and providing a link didn't work for me. Simply tweeting question titles, or my rephrasing of them, with a link to the question, didn't work for me. Posting a list of Stack Exchange sites that I find interesting, with a one-sentence description and a link for each, didn't work for me. A lot of these things do apparently work for other people, when they do them in their way. So try them in your own way. They may well work for you. I agree. All we need are more expert users. Everything else will come for that. I have been advertising to the extent that it's almost bothering my colleagues. Follow up! One thing I'll try over the next days is to take discussions/questions I had with others and just put them as questions here. Then, hopefully, good answers that I can link around will prove that the platform has its right of existence. 60 days in Beta - Battle cry? 150 days in Beta - Is it picking up speed? 180 +1 days in Beta - Is it acquiring a life of its own? 90 days in Beta - stable or stagnant? 272 days in Beta - What's next? Is the metric “Visits per Day” a median, a rolling median, or it is a mean, after all?